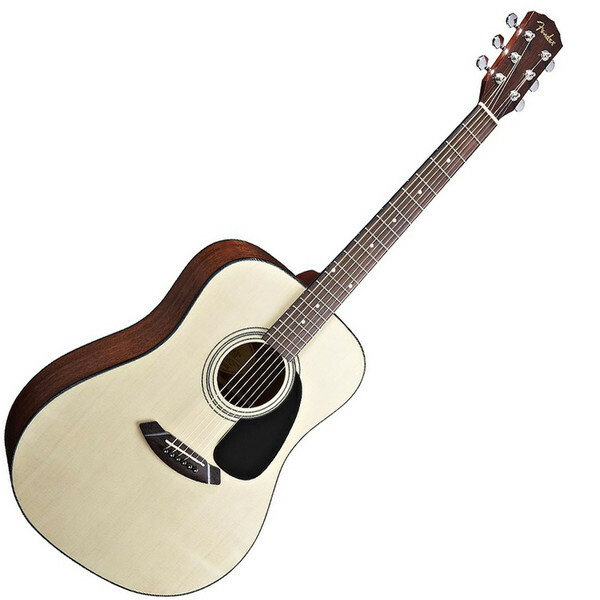 Home > Acoustic Guitars & Guitars > Fender CD60S – A Great Starter Acoustic? The Fender CD60S looks the business but what is it like to play? We all know that Fender make some of the best and most desirable electric guitars in the world. But they also make some brilliant acoustic guitars as well and with the Fender CD60S their aim is to produce a top quality beginners acoustic guitar. The question I have, is the Fender CD60S any good? I don’t know about you but generally when I think of acoustic guitars Fender doesn’t even enter into my thoughts. However, I was playing a few acoustics in my local guitar shop recently and I found out, to my eternal shame, that actually Fender make some very good acoustic guitars and that includes the Fender CD60S. Aimed at the beginner guitar market the CD60S is a budget acoustic with a whole lot to offer. So what can you expect from the Fender CD60S? The first thing to say is that the Fender CD 60 is not your bargain basement acoustic guitar. You would be hard pushed to find it for under £100 but then this is a guitar where it is worth spending a bit more money. We did a quick search and the cheapest we could find the Fender CD60S was on Amazon where it would cost you a fraction under . This means that the Fender CD60S is not the cheapest beginner acoustic guitar that you can buy. If you want some alternatives we wrote a review of some good budget acoustic guitars which you can read here. However, don’t be put off, if you want a beginner acoustic guitar that you will probably continue to play for as long as you play the guitar then it is worth paying a little bit extra for the Fender CD60S. The Fender CD60S comes in a number of finish options, the all mahogany version is a really beautiful guitar but typically costs a little bit extra. The version of the CD60S that I played is the natural finish with a spruce top and mahogany laminated back and sides. The 20 fret neck is made from nato and is topped with a sonokelling fingerboard. Overall the attention to detail was good for a budget guitar and I can safely say that the Fender CD60S is a very handsome acoustic guitar. Picking the guitar up it fits nicely into the body and is comfortable to play. The 20 fret neck is great and plays really smoothly but the access to the upper frets is restricted due to the shape of the body. Generally this is not a problem for me. But if you like to play on the upper frets you might want to look at an acoustic that has a Venetian cutaway. The Venetian cutaway provides a deep scoop in the guitar body where the neck and body join. This guitar body feature allows unimpeded access to the upper frets which is important if you think you will be flying up and down the fretboard. Well back to the Fender CD60S! We have already established that the Fender CD60S looks good and plays well but how does it sound? Well for the price the sound is really good. The Fender CD60S has a nice warm tone which resonates beautifully producing an acoustic sound that is amazing for a guitar aimed at the budget end of the market. For me the combination of a spruce top and mahogany back and sides helps give the CD60S a bigger sound with good definition and sustain. In answer to my initial question of whether or not the Fender CD60S is any good I think I can say that it is a very good acoustic guitar considering the price. There are cheaper acoustic guitars that you can choose to buy but I am not sure that they would have the longevity of the Fender CD60S. Therefore if you are willing to pay a little bit more I think that with the Fender CD60S you will get a great starter acoustic guitar that you will enjoy playing so much you will continue to use it for as long as you love to play the guitar. Not bad for the price! The Fender C 60 Natural finish will currently set you back £100 through Gear 4 Music. Ibanez GRG140 – Is it a Top Guitar?